In the first post in this series on the new features in MindManager 2019 I discussed the Corel’s increasing emphasis on the graphical and visualisation elements in MindManager (MM), starting with the additional conditional formatting options in the revamped SmartRules feature. Another example is the addition in MM 2019 of two new ways of viewing maps, Tag View and Icon View. Both allow users to see their maps not as a tree structure, but instead with topics organised into columns based on their tags or icons. In Tag View these can be general tags or those from any named tag group; MM 2019 comes with a group already created – Kanban, with three tags – To Do, Doing, and Done. If the tags are coloured the matching columns assume the same colour, as shown in the example below, while untagged topics are shown in a single Uncategorized column to the left. Similarly, Icon View allows users to show topics in columns based on a number of icon groups. These include MM’s default icon groups – Priority, Progress, Flags, Arrows, Smileys and Single Icons – as well as any user-created special icon groups. There does not appear to be a way to colour icon columns. While both Tag and Icon View are new, they draw on the Schedule and Priority Views introduced in MM 2018 which I discussed in an earlier post. 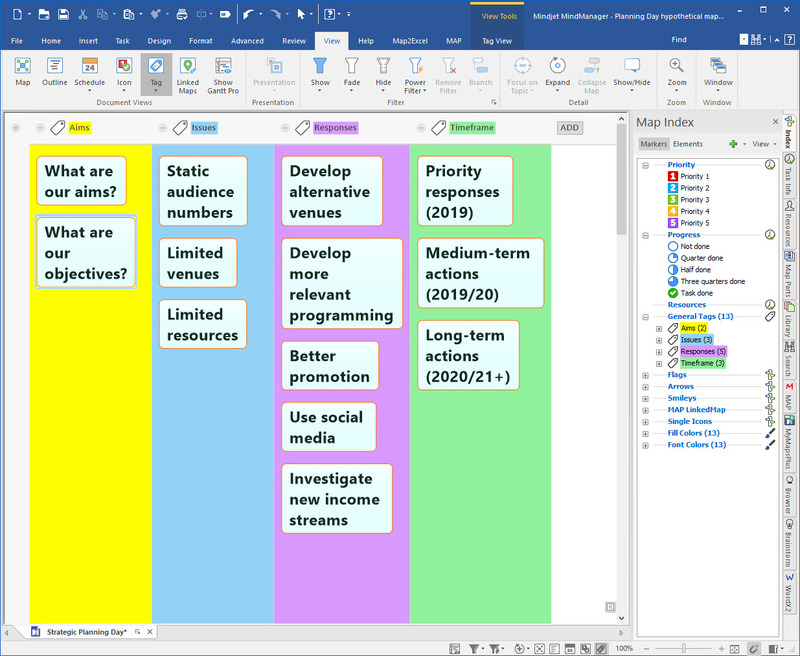 Schedule View has been retained in MM 2019, while Priority View has been absorbed into the Icon View. Both are incorporated in an expanded Document Views section under the View tab on the ribbon. The default group in Tag view is Kanban, while in Icon View it is Priority. Somewhat confusingly, the dropdown menu under each button in Document Views does not include a facility to change the default group – instead, this is made available by clicking on Tag or Icon View on the View Tools tab once the default or previously used view is opened. This reveals a set of Tag or Icon View Configuration options including an option to select a different tag or icon group. Other configuration options include the ability to mark a task as done, various sorting and topic formatting options and a button to return to the standard map view, as well as a More Options button. This leads to a dialogue box with tick boxes for options to show icons or tags, to dock uncategorised topics, hide tags or icons and also to hide the central topic. Right clicking on the top row of the Group view reveals additional commands to move or delete individual columns, which can also be moved simply by dragging them. Either view can be expanded or contracted using the standard map sizing controls and most other MM commands are also available. Both views provide fresh ways to view map data in a non-map format, which has a number of practical uses. 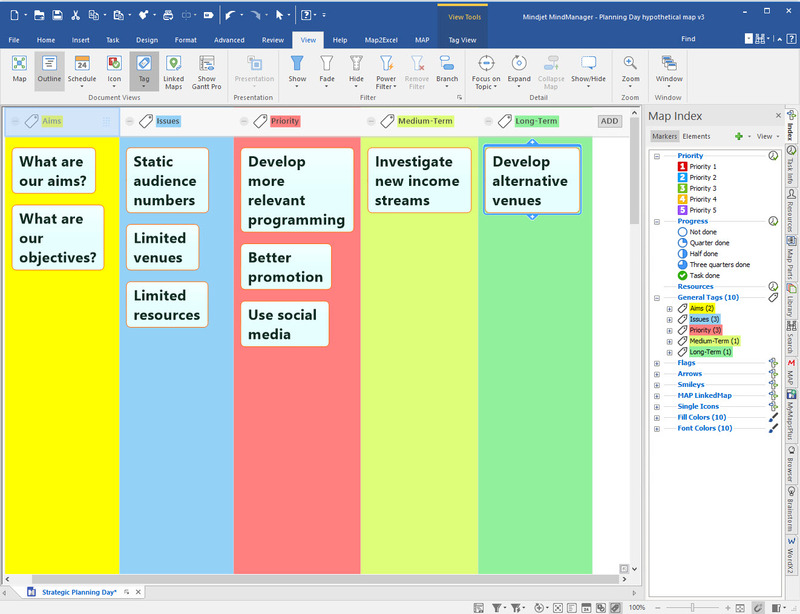 The included Kanban option is an obvious one, as the resulting Tag Group view resembles the increasingly-popular Kanban Board used for task and inventory management. The Tag view can also be used to provide a quick overview of things like survey results and Yes/No decisions, while the Icon view provides an easy way to review task priorities and progress (other aspects of task management relating to scheduling are handled in the separate Schedule View which I discussed in one of my articles on the introduction of MM2018). Topics can be moved from one column to another, and as they are moved their tag or icon adjusts automatically to match the new column. Unlike the formatting changes in SmartRules, which are applicable only while the rule is active, the changes caused by moving topics in either Tag or Icon Views are retained by the topic – at least until they are either edited or moved again. This provides an easy way to review and if required quickly edit a range of topic tags and icons. New columns can be added to either view on the fly. When a column is added the appropriate dialogue box for a new tag or icon appears. When this is done a new column with the relevant icon or tag name (and colour, if relevant) is added to the map and topics can be dragged into it from the existing columns. Similarly, new tag and icon groups can be created from within the Tag and Icon Views menus. Once the group is created, new columns can be added to it as described above. Navigation: As mentioned earlier, navigation is a little clumsy. It should be possible when clicking on the appropriate item in the Document Views section to also access a dropdown list of the available group options for either view, instead of having to load the default or previously-used view first and then change it. Multiple tags or icons: The new views work best with icon and tag groups that are mutually exclusive so that only a single tag or icon from the group can be added to each topic. If multiple icons or tags from the same group are added, the topic will be put in the Uncategorized column and a warning will appear advising the use of mutual exclusivity, though there is an option not to show this advice again. Hiding tags or icons: The option to hide tags or icons on topics in either view helps to reduce clutter, on the basis that the icon or tag name is shown as the column heading (and in the case of tags the column takes on the tag colour), thus making their appearance on each tag redundant. However, this is an all-or-nothing choice – all tags or icons are removed if this option is exercised, whether they are in the same group or not. It would be helpful to have a third option available, to hide only the tags or icons in the specific group being used for the view but not those in other groups. SmartRules: Tags or icons added as effects via SmartRules will appear in these views, but they cannot be moved into other columns. In other words, effects applied through rules that add or change tags or icons on topics can’t be overridden by editing them in Tag or Icon View. Resources: The most significant and frustrating limitation is that Resources are not available as a Tag View. This would have been a great way to show and reallocate tasks based on the people undertaking them. Obviously, there would have been problems with tasks involving multiple resources because of the exclusivity issues discussed in point 2 above, but for smaller projects in which tasks are each allocated to a single person the ability to show Resources in a Tag View would be very helpful. These new views open up new ways of working with and displaying the information in mind maps. Apart from project management and the other uses discussed earlier, the Tag View will be particularly useful for brainstorming, especially combined with some of the other new features in MM 2019. I’ll discuss this and also some workarounds for the Resources issue in a future post. 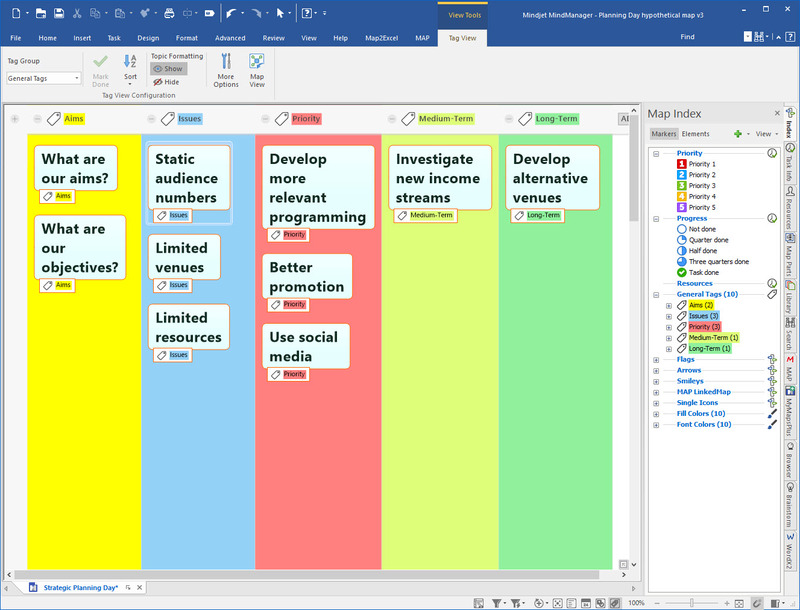 This entry was posted in Mind Mapping, MM2019, New Version Overviews, Viewing, Filtering and Formatting and tagged Mind Mapping, MindManager. Bookmark the permalink.